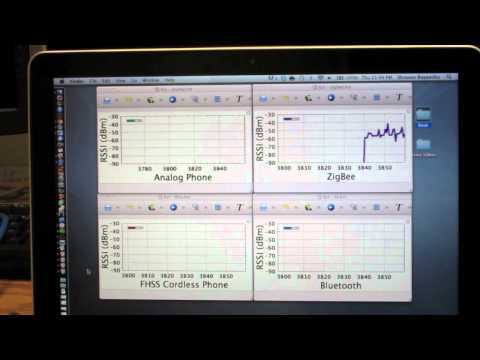 Airshark is a software-based solution that provides real-time interference diagnosis capability to WiFi devices. In particular, Airshark provides continuous detection of various sources of interference in the RF medium, their approximate location, and their relative impact on ongoing WiFi communication. For example, the system can inform a WiFi user that a nearby microwave oven is primarily responsible for all its poor performance, but a further away cordless phone is not. The unique problem solved by Airshark is that it implements an ability to detect non-WiFi sources of interference and their impact using commodity WiFi hardware. As a consequence, this solution can be implemented in any WiFi device. Unlike Airshark, existing products in the market (such as WiSpy by Metageek and Spectrum XT by Fluke Networks) rely on custom spectrum analysis hardware to solve a more limited version of this problem. Airshark, thus, makes it practical to integrate spectrum analysis capabilities in any WiFi-capable device alone eliminating the need for custom additional hardware.rnrnAt the current time, we have already developed preliminary prototypes of Airshark in our laboratory environment with great success. Our results indicate high accuracy of interferer detection. Airshark falls in the radio network management and systems innovations emphasis area of this competition. The solutions developed by us has significant and valuable Intellectual Property. We are in the process of filing for patent protection for this technology through the USPTO. Recent studies by organizations such as Infiniti Research indicate that the market size for such wireless network management technologies is anticipated to reach $718 million in the year 2014 only in the enterprise network space. Further, quick profitability and success of some existing incumbents (Metageek and Fluke Networks) indicate the viability of improved products in this space. Suman Banerjee: A tenured professor in CS/ECE @ UW-Madison and one of the co-inventors of the Airshark. Along with students, I have been intrinsically involved in all aspects of its design and implementation. In recent months, I have started exploring the commercial viability of this solution.rnIn the past, I have been involved in other technology commercialization effortsrnpast, serving as the CTO of a small startup (called Harvest Power Technologies, inrnthe smart energy domain). In June 2011, another technology from my lab (WiRover) was the grand prize winner of Wisconsin Governor\'s Business Plan Competition, which eventually was also the recipient of a National Science Foundation SBIR grant. have strong ongoing collaborations and interactions with all leading networkingrncompanies in the mobile and wireless networking space. Ashish Patro: PhD student of Prof. Banerjee in CS @ UW-Madison also involvedrnwith all aspects of the project with strong expertise in wireless systems. Votes received after the cutoff time of 5pm EST were not included in the official tally. When included the team received 3 votes.